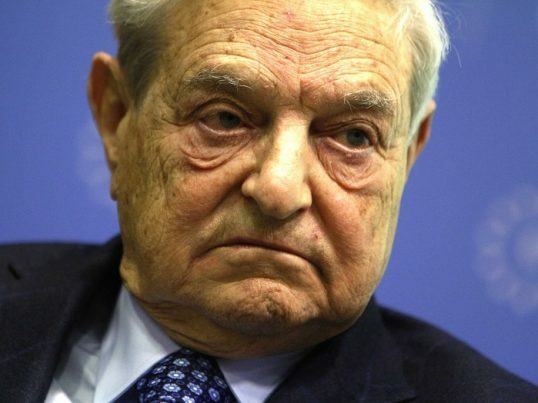 Voter fraud is real – especially when elections are handled electronically using questionable machinery owned and operated by none other than George Soros, enemy number one of the American people. Dr. Jerome Corsi from Corsi Nation, in a recent video update published to REAL.video, warns about how Soros-controlled electronic voting machines need to be banned prior to the upcoming midterm elections, otherwise the Democrats might try to steal votes. With more than enough evidence to indict the left for election meddling, it’s time to completely outlaw electronic voting period, and return back to paper ballots which are much harder to “hack” and don’t allow for the instantaneous switching of votes like the Soros voting machines do. Corsi actually suggests using blockchain technology instead of paper ballots, which he claims would make elections even more secure. “George Soros meddling in our elections,” Corsi says, urging the public to sign a White House petition calling on President Trump and his administration to take immediate action to protect the integrity of the upcoming midterms. It’s simple, really: all we have to do is remove all electronic voting machines from every precinct in the country, and replace them with simple paper ballots that are counted by hand and confirmed by witnesses. If the Democrats are truly devoted to transparency and honest and open elections, which they so often claim, then they should have no issue with doing whatever it takes to ensure that we put a stop to election meddling. In his petition, Corsi proposes the addition of blockchain technology, which he explains can be used to keep a precise mathematical count of all votes while still maintaining voter anonymity. All votes, using this method, would also be published on a permanent public ledger that cannot be hacked. “The true number of all votes will be visible to ALL voters forever,” Corsi’s petition reveals. The Democrats really have outed themselves for not caring less about the integrity of elections, seeing as how they continue to deny measures as basic as requiring that voters show proper identification before being allowed to vote. All of this needs to change if we, as patriotic Americans, have any chance of preserving our precious Republic and stopping the takeover of democracy by corrupt leftists who constantly lob false accusations against conservatives for doing what they themselves are actually doing. “Paper ballots could work, but miscounts/manipulation is still possible and the voter still never knows for sure, if their vote was tallied for their candidate,” warns Corsi in the petition. “With BLOCK CHAIN voting, every single voter can see ALL VOTES. And if they wish, can count for themselves,” he concludes. As of this writing, Corsi’s White House petition only has 2,562 signers of its 100,000 signer target. Please take the time to check out the petition for yourself, and if you agree with what it says, sign it so President Trump knows how We the People feel concerning the integrity of our elections. You can also keep up with the latest election news by visiting VoteFraud.news.